Colonel Milton B. Halsey, Jr. Colonel Milton Baldridge Halsey, Jr. Better known as 'Bud'. Career, army officer, local historian, public speaker known for his stentorian tones, large stature and gentle demeanor, passed on January 4, 2001 in Marin County. He was a walking encyclopedia on western Military history, US Civil War, General Custer, Indian Wars, the Presidio, coastal defense and Nike missile defense systems. He was born at Ft. Leavenworth, Kansas in 1933. He spent his childhood at numerous Army posts in the United States and overseas accompanying his father -- a Regular Army officer. In 1955, he graduated from the Citadel, the Military College of South Carolina, with honors, and received a degree in Political Science. As a Distinguished Military Graduate, he was commissioned a second lieutenant of infantry in the Regular Army. Bud served in a variety of infantry assignments in the 2d, 3d, and 5th Infantry Divisions, both in the United States and overseas. He is a graduate of the Infantry School, the Armor School, and the Command and General Staff College. He served in combat in both Korea and Vietnam as the Commander of the 2d Battalion, 38th US Infantry and as Senior Advisor to the 43d Vietnamese Ranger Battalion. In addition to service as an instructor at the Army's Command and General Staff College, he served on the staff of the Secretary of Defense and with the State Department. He also served in Germany and Panama; and as the deputy commander, 93rd Infantry Brigade; as Senior Army Advisor to the 91st Division; and with Headquarters, Sixth US Army. On August 1, 1985, he retired from the Army after completing over 30 years of service and rising to the rank of Colonel. His military awards include the Silver Star Medal, Legion of Merit (2 awards), Bronze Star Medal, Meritorious Service Medal (2 awards), Joint Services Commendation Medal, Army Commendation Medal (2 awards), the Vietnamese Cross of Gallantry with Palm, the Vietnamese Cross of Gallantry with Silver Star, Vietnamese Ranger Badge, Parachutist Badge and Combat Infantryman's Badge. Following his military career, he became the Executive Director of the Fort Point and Presidio Historical Association. 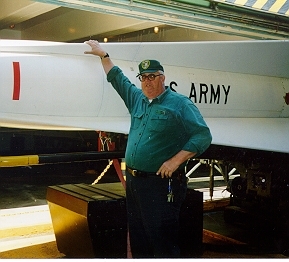 He was the driving force behind the refurbishing and opening as an historic site the Nike missile site in the Marin Headlands of the Golden Gate National Recreation Area of the National Park Service. Within the last decade, Bud devotedly served thousands of hours as the full time volunteer site manager. He authored numerous published articles on western military history, lectured, taught, gave tours, shared his vast store of knowledge and historical archives unstintingly and graciously with all who requested them. He was a member of various historical associations including charter membership in the Council on America's Military Past and had, at one time, served as its National Second Vice President and also served on its board of directors. He served most recently as the historian for the Fort Point and Presidio Historical Association. Bud was a self-effacing kind, generous, taciturn, highly-principled individual. He was a joy to be around, had a dry wit and a delightful sense of humor. He was a gentleman and a scholar. His wife of 43 years, Sandy; and their children Laurie, Tom, Jon and Meg remember him with warmth and love and plan to pass on to Bud's seven grandchildren his values and sterling qualities. Bud was laid to rest at Arlington National Cemetery on Halsey Drive.